WELCOME TO THE LEADING ONLINE RESOURCE FOR WALKING IN NORTH TYNESIDE. This website arose following the publication in leaflet form of seven North Tyneside `heritage` walks by North Tyneside Council and other interested parties. These seven walks form the centrepiece of this website and are intended to give the reader a taste of many of the `historical` facets of North Tyneside. Hopefully, the walks will entice the curious website user to put on their walking shoes and to explore the area of North Tyneside. In addition to these walks there are a number of other local titbits which, once again, may act as a catalyst to take a peep around the next corner. So, why not give it a go…………you might just be pleasantly surprised. Shipbuilding dominated Wallsend for more than 100 years. The Roman fort of Segedunum stands at the eastern end of the 73 mile long Hadrian`s Wall and enjoys World Heritage Site status. Visitors arrive in Wallsend from far and wide, some having just completed the Hadrian`s Wall National Trail. The town has produced more than its fair share of professional footballers, one of whom appeared on one of the most well known album sleeves of all time. There is more to the riverside town of Wallsend than first meets the eye. What better way to uncover a little of what makes the town tick than to visit THE WALLSEND DISCOVERY WALK. Start your journey now. The area known as North Tyneside lies adjacent to the City of Newcastle upon Tyne and, with the River Tyne forming its southern boundary, it stretches out as far as the North Sea to the east. The coastal strip, with its golden sands, has been a popular destination for generations of visitors and, whilst the heyday of the British seaside holiday is now a distant memory, the area still attracts visitors from far and wide. 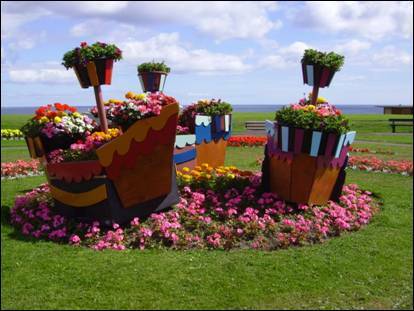 The towns and villages of Whitley Bay, Tynemouth, North Shields, Wallsend and Cullercoats each has its own individual character and history and together they offer the visitor a broad choice of attractions. Why not start your exploration of North Tyneside by setting out on THE WHITLEY BAY DISCOVERY WALK now. In March 1867 author of the moment, Charles Dickens, visited Tynemouth and in a letter he wrote, “….we escaped to Tynemouth for a two hours` sea walk. There was a high wind blowing and a magnificent sea running. Large vessels were being towed in and out over the stormy bar with prodigious waves breaking on it, and spanning the restless uproar of the waves was a quiet rainbow of transcendental beauty. The scene was quite wonderful.” What better recommendation do you need for a walk beside the sea at Tynemouth or indeed to walk the full length of the invigorating North Tyneside coast. Visit THE COASTAL WALK and start your journey southwards. The village of Tynemouth is the starting point of THE ART OF CYCLING BIKE TRAIL, a 62 mile journey of discovery along the cycle tracks of the Counties of Tyne & Wear and Durham. Along the way you will encounter numerous thought provoking works of public art. This is an epic days bike ride from sea level at Tynemouth to nearly 1000 feet at Consett, high in the Durham Hills. You will then enjoy an exhilarating 26 mile descent back to sea level at Sunderland before returning along the coast to Tynemouth, crossing en route the mighty River Tyne via the South Shields to North Shields ferry. Download a fascinating route description now and prepare for the ride of your life. Whatever the weather, a walk around the sights of North Tyneside will not disappoint. However, a bright sunny day, even with snow on the ground, will give your journey of discovery `added value`. So why not check out the weather forecast before embarking on your walk. Just visit WEATHER FORECAST for a hint of what is in store for Whitley Bay and the immediate vicinity over the next few days. There are many blue plaques attached to important buildings in North Tyneside. How many do you know of? Why not take a look at THE BLUE PLAQUE WALK and embark on a journey of discovery around the buildings of Tynemouth and North Shields. It will only be the start! The renowned American watercolourist, Winslow Homer stayed at the Bay Hotel (then called the Hudleston Arms Hotel) when he first arrived in Cullercoats in 1881. The hotel was demolished in 2005 to make way for new luxury apartments. Following representations by the author of this website to both the Developers and North Tyneside Council, it was agreed that the development would be named `Winslow Court` in recognition of the site`s historical importance. This name aroused much local interest. Representations were also made regarding the erection of a blue plaque on the building after completion of the development and once again North Tyneside Council agreed to action this. The building is now occupied and the blue plaque was finally erected on the 19th February 2008. 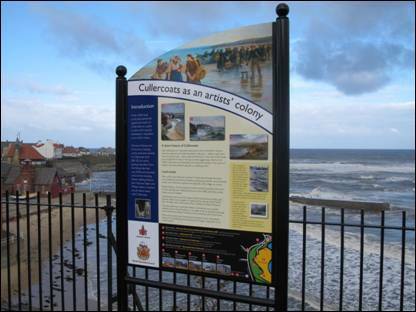 Why not visit THE COASTAL WALK to learn a little more about the illustrious past of Cullercoats or if you are interested in finding out more about the paintings of Winslow Homer just CLICK HERE and discover a world of beautiful paintings. When you step out on THE WHITLEY BAY DISCOVERY WALK you will discover for yourself some of the fragments of the town`s rich and varied past. The walk, the fifth in the North Tyneside series, has now been published in leaflet form and is available free of charge from North Tyneside Libraries and Tourist Information Centres and from some Whitley Bay shops. The walk can also be downloaded from this website and also from www.tynetown.co.uk . Be prepared to be surprised. Two additional walks in the Discovery series of North Tyneside Walks are now available on both websites and also in leaflet form. These are THE NORTH SHIELDS DISCOVERY WALK and THE WALLSEND DISCOVERY WALK. Be sure to spend some time seeking out these walks and then fasten up your laces and start your own journey of discovery. Once you have enjoyed these walks in North Tyneside why not step beyond the boundaries and experience a trip around some of Newcastle upon Tyne`s magnificent streets. After all, the architect who designed some of the most beautiful buildings in the city was born in North Shields at the heart of North Tyneside. Just click here to visit A CITY OF LOCAL LEGENDS : NEWCASTLE UPON TYNE and then be on your way. All material on this website is subject to the copyright of the author. Whilst website visitors are free to download the material for their own personal use, the material, in whole or in part, must not be reproduced in any other format whatsoever without the prior written permission of the author. A request for permission should be made by emailing gh@northtynesidewalks.co.uk .